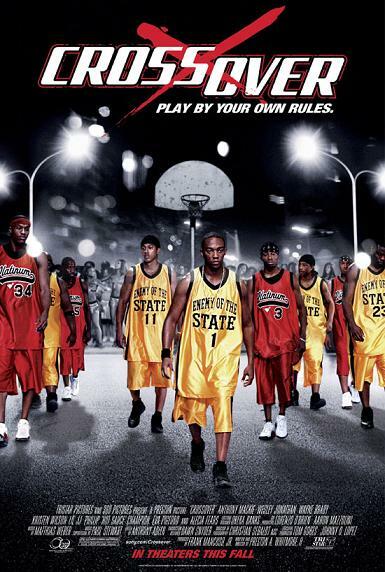 Release Date: September 1st, 2006 by TriStar Pictures. The Cast: Anthony Mackie, Wesley Jonathan, Wayne Brady, Alecia Jai Fears, Eva Pigford, Little JJ, Philip Champion. Directed by Preston A. Whitmore II. BASIC PREMISE: Tech (Mackie) and Cruise (Jonathan), team members of Enemy of the State, must defeat Platinum, the opposing team, in an underground street ball game. ENTERTAINMENT VALUE: Crossover has very little going for it in terms of entertainment value because almost every scene reeks of contrivance and none of the performances are beyond mediocre. Tech and his best friend Cruise join the Enemy of the State street ball team which will compete in a game against Platinum. Vaughn (Brady), a sports promoter, oversees these underground street ball games. Philip Champion plays Jewelz, a MVP for the Platinum team. In a silly, underdeveloped subplot, Tech and Cruise have a romance two women, Eboni (Fears) and Vanessa (Pigford), respectively. None of the conflicts really get fleshed out such as the fact that Cruise could lose a UCLA basketball scholarship if UCLA finds out that he plays street ball. Unfortunately, Anthony Mackie, who was great in Brother to Brother and Million Dollar Baby, delivers a mediocre performance here. A weak, stilted script by Preston A. Whitmore II doesn’t allow any of the characters to be remotely interesting or believable—they’re just physically appealing. As a director, Whitmore goes overboard with fast editing and includes awkward, unnatural transitions between scenes. Even the few street ball scenes are more headache-inducing than involving and the musical score/soundtrack doesn’t help much either. Overall, this forgettable movie has poor direct-to-video quality. INSULT TO YOUR INTELLIGENCE: Contrived and dull. IN A NUTSHELL: A contrived, dull and stilted with a poor “direct-to-video” atmosphere.